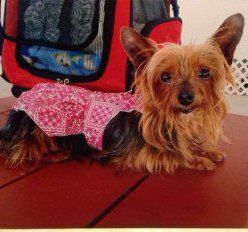 There will changes to make in regard to care when your Yorkie starts to transition from adult to senior. And while this is not the most pleasant topic for many, an aging dog can have a completely fulfilling life. There is not one particular day that your dog will suddenly be 'old'. Just like humans, it is a gradual maturing. By accepting the fact that your Yorkie is indeed aging, you can then take steps to keep him or her as healthy and happy as possible. This is actually a gray area. In general, this is determined by the size of the dog. Since toy breeds typically live longer than large breeds, toys are given the label of senior between the ages of 8 and 12 years old. With this being said, a Yorkshire Terrier will be declared a senior by the veterinarian who decides this based on the dog's health, his or her activity level and general signs of aging such as slowing down, etc. It is safe to say that an 8-year-old is a mature adult and that a Yorkie that is at least 10 years old has crossed into the category of senior. This will be true regardless of whether the vet has made an official announcement. While things will not change overnight, there are definitely some elements that will need to be adjusted for an older dog. 1) Timing of veterinarian visits - One of the most important aspects of caring for an older Yorkie will be to have the dog screened for health issues that are common with aging dogs. These are known as geriatric checkups. A senior will be seen twice per year as opposed to just once. It is important to keep these appointments because at the age of 8 and up, medical issues can develop rapidly; running tests only once a year is just not sufficient. Possible testing done as needed will be an electrocardiogram, stool testing and x-rays. 2) Exercise Changes - It's really important to keep your Yorkshire Terrier mobile for as long as possible. That old adage of 'use it or lose it' applies to canines as well as humans. Hopefully you have been taking your Yorkie for daily walks all throughout his or her adult life. This will certainly help a dog in the senior years. You should walk a senior Yorkshire Terrier almost the same amount of time as when he was younger. The key is to do this in shorter increments. If your dog is used to walking twice per day for 30 minutes each session, this can be modified a bit for an older dog with a short 15 minute walk in the morning, a 15 minute walk late afternoon and a slightly longer 20 minute jaunt in the evening. By spacing this apart in this manner, you offer a senior the great benefits of exercise without overtaxing the dog or putting too much stress on the joints. Other things to keep in mind in regard to exercise requirements for senior Yorkies is that while they may still love to be active, they need to have more water breaks and to be protected more in regard to temperature extremes. Always bring along a travel container with water even if you're only going to the park for a little while or for a quick walk through the neighborhood. Stop at the halfway point for a 5 minute break to hydrate. Be mindful of hot humid days in the summer, taking care to limit outdoor activity during the hottest parts of the day. Seniors will can quickly become overwhelmed when the weather is thick with humidity. On cool to cold days, a nice soft sweater or vest can be just the thing to keep a senior Yorkshire Terrier feeling comfortable so that he or she can enjoy an outing without catching the chills. 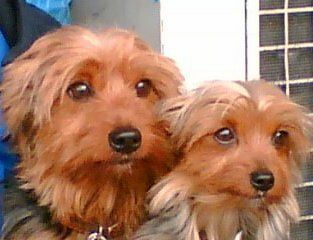 3) Food and appetite changes - You do not necessarily need to change a Yorkie from an adult food to senior food and there is good reason why. First, there are no governing agencies that give out any guidelines whatsoever in regard to what qualifies as a 'senior food'. The AAFCO (Association of American Feed Control Officials) and the National Research Council (NRC) have no documentation on this at all. Therefore, commercial dog food companies decide for themselves in which way they are going to change their senior formulas. Some will have less protein, others will keep it the same. Some will add certain supplements, others will add different ones. Also, one of the main differences between adult and senior varieties is the calorie count. This is because many dog breeds tend to become overweight as they age. However, with such a small frame and a rich history filled with generations of being such an active dog, the Yorkshire Terrier rarely becomes overweight, even as a senior. If you are giving your Yorkie a good, quality brand there will be no harm in switching to the senior label, however this normally is not an urgent requirement. And you can certainly speak to your vet about any concerns in this regard. In many cases, due to a slightly slowing metabolism, many older Yorkies have a slight decrease in appetite. This alone usually makes up for the fewer calorie needs and helps a senior maintain weight. While slight decrease in appetite is expected as a Yorkshire Terrier ages, any noticeable changes should be reported to the vet. It is important to not write this off as a normal signs of aging since many health issues can cause a dog to not want to eat including dental issues and stomach ailments. 4) Supplements - There is no need to load your senior up with nutritional supplements just because he or she has reached their senior years. Rather, each dog must be looked at as an individual and a determination should be made based on a particular dog's needs. Some older Yorkshire Terrier will begin to develop joint related issues including arthritis and in those cases, a quality supplement for aging dogs and joint health would be appropriate. It is not uncommon for older Yorkies to struggle a bit with dry skin issues and for that reason a good Omega 3 or Omega 3,6,9 can be helpful. You veterinarian will be able to guide you regarding your dog's needs. While some foods are already packed with more than enough vitamins, offering a complete vitamin and mineral supplement can only be beneficial.... anything not needed by the body will be eliminated and any needed nutrients will now be present that would otherwise have been lacking. Do be sure to choose a quality brand and only offer one per day. 5) Grooming changes - You will want to keep up with proper grooming and using really high quality products because the skin is going to be more sensitive on a senior and the coat may start to thin a bit. It is not normal for an senior Yorkshire Terrier to have balding spots however it is common for the coat to lay a bit flat and for the density of the coat to thin out. For any areas that are thinning enough that skin can be seen, apply some sunscreen if your dog will be outside for more than 20 minutes on a warm sunny day. Photo courtesy of Nigel R.
6) Sleep - It is normal for a senior Yorkie to sleep more than when he was younger. Typically an older dog will add naps to his schedule and also may sleep a bit longer in the morning instead of jumping awake when his owners do... Or he may retreat to rest while the family is still relaxing around the TV. It's important that a senior be given an age-appropriate bed. Needs are different now and even if your dog is very much attached to his bed, he will be better off with an orthopedic mattress that offers the right amount of support for an aging body. 7) Environment - Senior dogs are rather set in their ways and often do not do well with changes. While an adult may welcome a new addition to the household, a senior may become frustrated with a rambunctious puppy. If you are thinking of adding a new puppy to the house, this should be given a lot of thought and the needs of your senior should be at the forefront of your decision. Also, older Yorkies often do not like changes in the set-up of the home. It is best to not rearrange furniture or make any changes could cause some confusion. Seniors may start to have some issues with decreased vision and/or hearing, so keeping things just as a dog is used to is often best. Since older dogs can have a lower tolerance for noise and commotion, if you'll be having people over your Yorkie will appreciate being lead to a quiet spot and for activities to not be taking place near his favorite resting areas. 8) Keeping an eye out for changes - It's easy to let a day slip by and then the next and before you know it, a whole week flew by and you really haven't checked your Yorkie for specific problems. However, since health issues can develop very quickly with a senior dog, you'll want to make a point to routinely check your Yorkshire Terrier's eyes, ears, mouth, nasal passages and paws. Also, be sure to run your hands over your dog's entire body to check for any abnormal lumps or bumps. While we cannot stop our dogs from aging and while sadly they do live much shorter life spans than we do, we can play an active role in the quality of life that our senior Yorkies have and to protect them with preventative care and quick diagnosis of any potential health issues.